Christian and Muslim leaders lashed out Monday after India’s minister for social justice said the government would not be granting job reservation rights to “untouchables” who converted. In remarks published Friday in India’s local media, Minister Thavar Chand Gehlot said the newly installed government considered the ongoing fight for equal rights illogical. "They left the Hindu fold to escape the scourge of untouchability as it did not exist [in Islam and Christianity]. The conversion has solved the problems they faced as Hindus so they should not ask for Scheduled Caste status,” he said. In order to improve their social standing, dalits, or untouchables, have constitutionally guaranteed “reservation rights” allowing them access to particular government jobs, and seats in educational institutions. Christian and Muslim dalits have been fighting for the preferential access given to their Hindu counterparts since 1950, when a presidential decree denied the rights to non-Hindus saying caste is a Hindu phenomenon. It was later modified to include Sikhs and Buddhists, but continues to exclude Christians and Muslims. The minister's statement is "sheer discrimination against the Christians and Muslims," Samuel Jayakumar of the National Council of Churches in India, told ucanews.com on Monday. Jayakumar and other leaders said they fear this statement will be echoed by judges considering a long pending case in India's Supreme Court. The complaint was filed in 2004 by Christian dalit rights groups who argue that caste is a socio-economic reality that does not change with conversion. “The government is scared of granting us dalit status. Christians and Muslims were removed from the list after pressure from Hindu nationalist forces in 1950,” Hafiz Ahmed Hawari, head of the All India Jamait-ul Hawari, told ucanews.com. Father Z. Devasagaya Raj, secretary of the office for dalits and backward classes of the Catholic Bishops’ Conference of India, refuted the minister’s claim that conversion erased the difficulties. “They are even discriminated by others in the Christian community,” he pointed out. 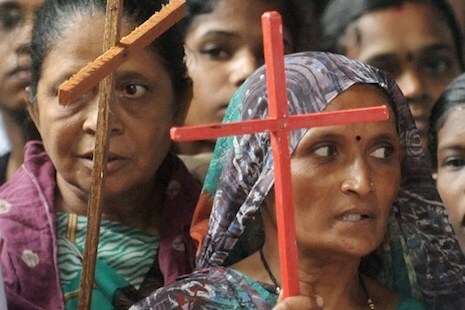 Christian leaders estimate that at least half of India's 23 million Christians are of dalit origin.